This program is open to all schools in southern New Mexico. Call the Asombro Institute office (575-524-3334) to schedule your school’s field trip! Students are introduced to local desert animals and their physical and behavioral adaptations. Use of live animals is key to giving students an up-close look at some of the more elusive animals found in the desert. Students observe similarities and differences within groups of items. They then group the items into different categories based on visible characteristics. 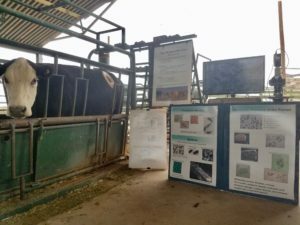 Students learn about the digestive system of a cow, the difference between the cow’s digestion and human digestion, and the microclimate within the cow’s rumen. This station teaches students how to properly use binoculars and hand lenses to view the desert world a little closer. By using these tools, students will identify and draw different natural objects at close range. Students are introduced to the social insects (ants, bees, and wasps). After learning what makes these groups similar, students play an active game that shows the benefits of sociality on food gathering and defense. The game is really a simple scientific investigation and requires students to pay attention to instructions, compare two situations and communicate their results.